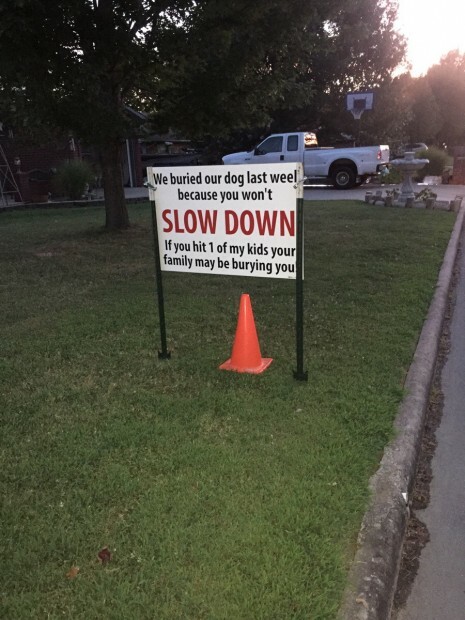 An family upset about a motorist killing their dog has posted the following sign in their neighborhood. This opens the door to several debates, particularly speeding, age, and animal control. Animal owners must do their best to keep their animal in control. We don’t know the circumstances of this accident, so we cannot assume that the owner was negligent. Keep your dog on a leash and control your animals as best as possible. Maybe the dog got loose by accident. Don’t speed so fast in a neighborhood that even a dog can’t get out of the way. However, we don’t know what kind of dog this was. Was it a big dog? Small dog? Blind dog? Old dog? Dog with an injury laying down and the driver was in a monster truck? 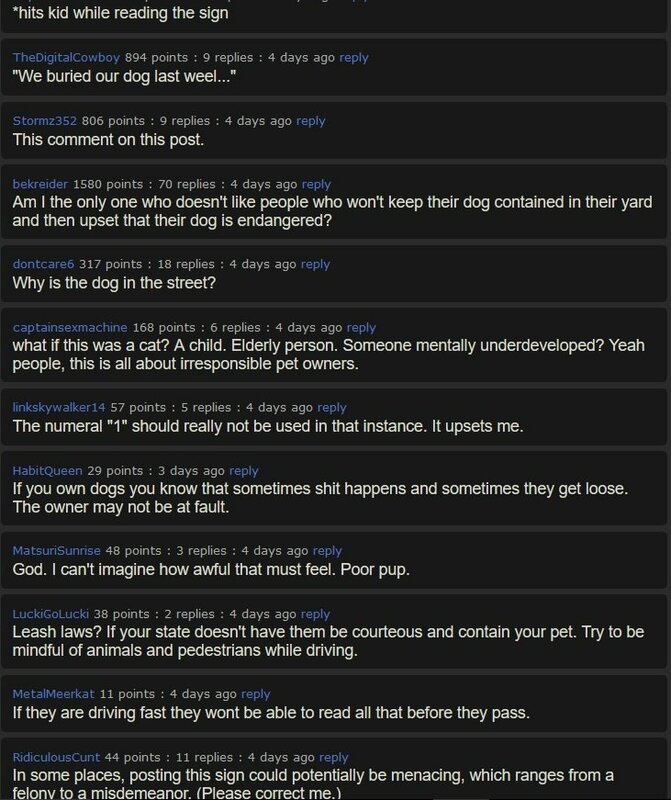 We have no idea and we cannot assume anything to support the dog or the driver. At the very worst, the driver just hates dogs, but if that were the case, then Ricky Gervais would spend all week Tweeting about it. Maybe it really was an accident. We don’t know anything about the driver. Were they a teenager? An old person? A blind person with one arm? We don’t know anything about the driver or the type of vehicle they drive. If this happened to me, then I would feel the same way. I live on a main road and have my fair share of folks speeding to nowhere and occasionally a deer is found with four feet pointing to the clouds and it’s rather sad considering how small and short this road is. I suppose, for the love of animals and (I’m assuming) a blind grandpa with a peg leg not ruining his super charged neon green 2015 Mustang, that we should all drive considerably when in residential areas. We really don’t need IMGUR flooded with these pictures and comments.